So I finally booked the internal flights in Brazil. I was originally going to book them with GOL, but in the end the TAM flights came in at about the same price and with more civilized flight times. So I went for those instead. Plus I could book them through a UK based website (ended up using lastminute.com), so at least I can phone someone here if there is a problem. Yes, it looks like we are going to visit the Pantanal, although it was a bit of a struggle to find a good tour guide at a reasonable price. We’ve got a reservation with the Jaguar Eco Reserve for a 4 night/5 day visit including boat trips, fishing for piranhas, walking and maybe spotting those big cats if we’re lucky… I’m really excited! Coincidentally there was an article in the Independent on Saturday on Brazilian eco tourism which mentions Eduardo, who we’ve been corresponding with by email. It’s not been easy to sort this out. 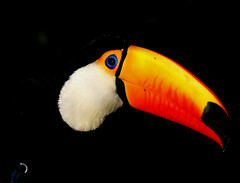 First off we contacted Julinho of Pantanal Trackers who gets great reviews everywhere online. But unfortunately he was fully booked for August – obviously his reputation goes before him. He put us in contact with his cousin, who was also busy when we were hoping to be there. He put us in contact with someone else, who was also busy, at which point we gave up on that line of enquiry. 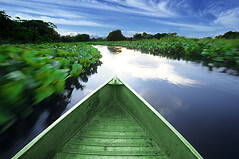 We had also been in contact with Pantanal Nature who also get good reviews online. They had an offer, but it seemed a bit expensive even if we opted for camping. Last night we found that Eduardo offered transport and activities alongside accommodation and food, so we sent him an email, not expecting a quick response (it says they try to respond within a week!) but he got straight back with a good price of 500 USD per night for the family, all inclusive. So we’ve reserved it. 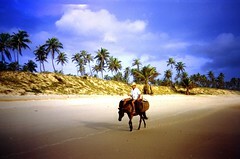 Now we need to buy ourselves some flights from Rio and then on to Salvador…. Our round-the-world tickets take us to Brazil, into Rio and out of São Paulo three weeks later. Unlike Australia (where we are taking 3 internal flights) there is no Brazilian airline in the OneWorld alliance, so any flights within Brazil will have to be bought in addition. Having looked at various options, it seems that GOL is the best airline for cheap fares. The alternatives (TAM, Azul, WebJet, OceanAir and Trip) all seem to be more expensive. To search all of them at once, try Mundi.com.br, as I found that the flight search site I usually use (Kayak) only picks up flights from TAM. Alternatively, if you go straight to the GOL site and choose “buscar por preço” (search by price) it will show you the costs of flying on different dates, which can vary massively. Note that you also seem to get shown more days if you use the site in Portuguese than when you switch to English. 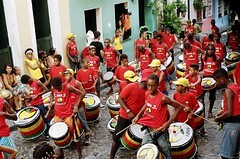 Salvador: The historic african heart of Brazil with some amazing beaches along the coast. The Pantanal: The world’s biggest wetland, almost the size of the UK and home to jaguars and alligators. 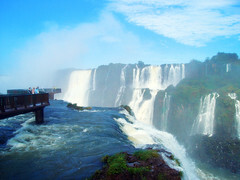 Iguaçu Falls: One of the world’s biggest waterfalls on the border with Argentina and Paraguay. We don’t want to miss out on seeing things, but we also don’t want to burn ourselves out. Decisions. Decisions. As I said in my previous post, we booked the tickets some months ago now. But how did we come up with the route? It can certainly be quite mind boggling when you look at a map of the whole world and think “right, where are we going to go?”. To begin, we knew that we would be going to Australia. My parents are planning to be in Brisbane for 3 months and we wanted to meet up with them. We also wanted to go to Brazil, because we’ve learnt some Portuguese in the past and none of us has ever been to South America. Plus our former teacher has moved back to Rio, so we’d be able to meet up with her. I have relatives in New Zealand and the only visit any of has made there was when I went there aged 12. So that got added in. None of us has been to Japan or Hong Kong, so those looked like interesting stops on the way to Australia. Finally, all flights to South America from New Zealand seem to go through Santiago, so Chile was added to the list. As it turns out we’ll be leaving on the second day of the World Cup and every country we visit will be taking part (except Hong Kong & Macau). Obviously I’ll be supporting England, but it may be difficult to catch the games (especially as we’ll be in the air for the first one). Apparently one of my New Zealand cousins used to play football with a member of the NZ World Cup Squad, so he’s hoping to be flying out to South Africa to cheer him on (and the rest of the All Whites). We bought the round-the-world tickets back in October. We bought them with OneWorld, which is an airline alliance including Qantas, BA, JAL, Cathay Pacific, American, Finnair and (importantly for us) LAN from Chile. We wanted to go to Brazil and if your route includes South America, then your options are definitely reduced. The other airline alliances, Star Alliance and SkyTeam, don’t include a South American airline, so they weren’t any good for us. Initially we went to the local Trailfinders shop in Oxford – they were the ones who pointed us at the OneWorld Explorer ticket. But on our second visit it was mentioned that they would be charging us £125 fee per ticket. Which would be £500 on top of the ticket cost. Gulp! If it had been £10 per ticket it wouldn’t have been a big problem, but sorry, that is an awful lot of money for something you can book yourself. So we decided that we’d book it online using the interactive booking tool. I spent countless hours building the itinerary. When it came to the moment of booking though, availability had disappeared for our flight from Auckland to Santiago. It seems that there are limited seats on certain planes for RTW ticket holders and this was one of the ones that fills up early (10 months ahead in this case!) In a panic we made a new itinerary, including longer in South America, so that we could catch a flight one week earlier. Then we pressed the button and bought the tickets. We really were doing it.